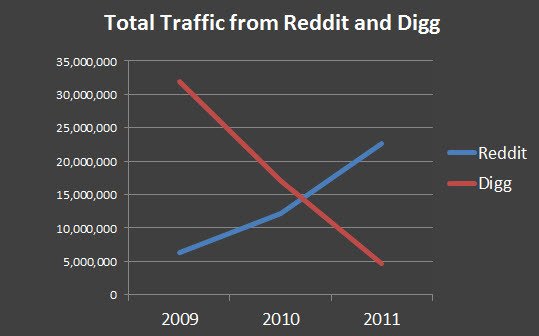 The rise of Reddit and the steady decline of Digg have been well documented. Just recently Reddit announced that its traffic has more than doubled in less than a year (to 2.07 billion pageviews in December), an impressive feat. Has this translated into a significant change in social news referrals for publishers? I wanted to get a better idea of just how much of a shift has occurred with some of the publishers that we work with at Define Media Group. So I pulled the 2009-2011 Reddit and Digg referral figures for selection of 12 major magazine and Web-only content sites. I’m not able to reveal the specific sites or figures due to confidentially requirements but they are all well established brands. I intentionally chose sites from several different publishers and focused on those with content that is a reasonably good fit for social news sites. To anonymize the data I combined each site’s figures into a total number for the group. The numbers represent visits, not pageviews. 12 sites is a very limited sampling so this survey is certainly not meant to be conclusive. I just found the comparison interesting and I thought I’d share the findings here. 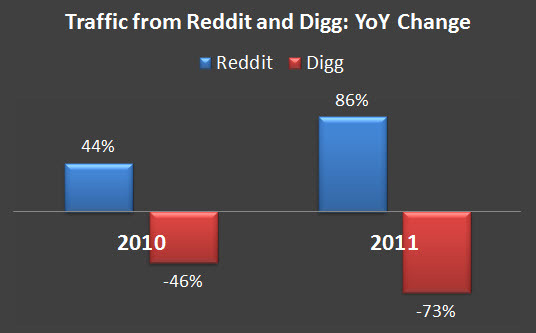 The trend lines tell the story loud and clear: traffic from Reddit is way up and traffic from Digg is way down. Among the surveyed group, Reddit went from a combined total of 6.3 million visits in 2009 to 22.7 million 2011. Conversely Digg dropped from 31+ million in 2009 down to 4.6 million in 2011. Again the numbers look great for Reddit and not so good for Digg. Nearly all of the surveyed sites have seen substantial gains from Reddit in the past few years and significant declines from Digg. Only one site in the group saw a slight increase in Digg traffic in 2011 and just one saw a slight decrease from Reddit. Otherwise the figures are overwhelming in favor of Reddit. The decline of Digg was already apparent when I did a basic survey of Twitter, Facebook and Digg traffic to newspaper and magazine sites in early 2010 and the negative trend continues today. Digg is certainly trying hard to improve its position through initiatives like Newsrooms and Digg Social Reader. We’ll see if they can stem the tide. What you are seeing with your own traffic? If anyone is willing to share their figures or experiences either in the comments or privately, I’d be interested to hear from you. Official Publisher Profiles on Digg One Year Later: Followers up 720% But Have They Died on the Vine? Thanks for digging into the data Adam — really good stuff. John Boitnott of Hasai and I were having a discussion about this the other day. The numbers here back up what we’ve been seeing as well. Have to admit you would have to have been blind not to see this happening. Reddit proved that maintaining quality over spam access wins out in the long run. Thanks Adam, I’d been meaning to pull some combined figures for a while now. Our conversation motivated me to do it. Oli – agreed. I just thought it’d be interesting to share some real (albeit it necessarily anonymized) numbers. You should also warn all of your readers that any publisher caught spamming reddit or manipulating votes or having editors submit and vote on their own stories may be subject to a site wide domain ban. reddit has much stricter rules in this regard than digg and other sites. reddit is not a social bookmarking site or distribution channel, and it is the publishers’ responsibility to understand the community. I am sure there are some that have gotten away with such tactics on reddit, but anything beyond organic activity has a significant risk, and we will only be increasing enforcement efforts. Make remarkable content and reddit will find you and send you heaps of traffic. Try to take shortcuts and you will eventually pay the price. Erik – thanks for stopping by and commenting, I appreciate it. The aim of this post is definitely not to encourage publishers to start trying to aggressively promote their content or manipulate activity on Reddit. But publishers do try to gain a good understanding of where their traffic is coming from (across all types of channels, be it search, social media or others) as well as a sense of how things are trending and changing over time. I thought the dramatic shift among the sites I looked at was interesting so I just wanted to share the figures here, and hopefully learn about similar experiences from others. What I’ve noticed with Reddit is that they are much more strict when it comes to sharing links. They only allow a certain number of links to be shared within a given timeframe. This could help with the quality of links on Reddit as apposed to other social bookmarking sites. It helps to keep the spammers away. Thanks for the input Nick; I somehow missed your comment when you first made it. Strict but reasonable user-focused rules sounds like a good approach for social sites that are ripe for abuse.